The National Trust has objected to a recent Permit Application by VicTrack for part demolition, conservation, and security related works at the West Block Southern Extension at Newport Railway Workshops, one of the state’s most significant industrial sites. While the justification for the works put forward in the application is “the practicality of securing the site and rendering it safe and manageable following the 2015 fire damage”, it is unclear what VicTrack’s broader plans are for the site, and there is no overall masterplan to guide the works. Click here to read the full submission. All of the above buildings are identified in the Conservation Analysis and Management Plan completed by Helen Lardner Conservation and Design in October 2000, as being of Primary significance, apart from the Machine Shop Extension and Garage, which is identified as being of Contributory significance. As clearly outlined in the Statement of Significance, the subject site is highly significant because the complex of buildings—as a whole—demonstrates a period of change and expansion at the Workshops, which is still evident in the existing fabric. The demolition of the above buildings would therefore compromise this identified significance. The West Block Southern Extension of the Newport Railway Workshops is a complex collection of interrelated buildings which tell an important story about the operation of the Workshops during the twentieth century. The lengthy citation for the site in the Victorian Heritage Register highlights that ” more than any other part of the Newport Workshops, it reflects the important change in role of the Workshops from the initial concept of maintenance of rolling stock to the manufacture of locomotives and the subsequent expansion this meant for the Workshops.” See below for an extract from the citation. The whole of Building 65, except the Machine Shop Extension, is of historical, scientific and architectural significance to the state of Victoria. The Machine Shop Extension is of contributory significance. The West Block Southern Extension is a collection of smaller buildings which grew incrementally and were enclosed as one structure from 1910 onwards. Because of the many changes in name and function, it is difficult to clearly date all the components. A 1913 list provides evidence that parts of the Williamstown Workshops were re-erected at Newport in 1897 within the West Block Southern Extension. The distinctive timber trusses of the Fitting Shop Extension and South of Fitting Shop Extension and the approximate areas involved mean that they may be these sections. The Boiler Shop Extension, the Smithy Annexe and Fitting Shop Extension were already constructed by 1905. In c1908 the Hydraulic Riveter Shop was built and the Blacksmiths Extension was from the same year. The 1910 drawing of the roofing of the Truck Building Yard shows that the Air Compressor & Westinghouse Brake Shop was already in existence and was modified with the south wall removed and reinstated as part of the south wall of the Truck Building Yard at this time. The construction of the Machine Shop Extension is similar to the Truck Building Yard and it is believed to date from between 1915 and 1928. The likely evidence of earlier buildings is of archaeological potential although little may be learned which is not already understood from existing documentation. The historical significance of the West Block Southern Extension is that, more than any other part of the Newport Workshops, it reflects the important change in role of the Workshops from the initial concept of maintenance of rolling stock to the manufacture of locomotives and the subsequent expansion this meant for the Workshops. This change, combined with the increasing use of metals in production, resulted in the need to expand West Block. The incremental growth of a number of small buildings between 1897 and 1928 is still demonstrated in the physical fabric. It was also the design limitations for expansion of West Block Southern Extension with Champion Road and the dead end track design which gave rise to the need for the construction of purpose built locomotive facilities in the late 1920s. All of the components of West Block Southern Extension are of considerable age and the area was used continuously for the same Workshop function for 70-80 years; the Boiler Shop Extension c1905, the Smithy Annexe c1905, the Fitting Shop Extension c1905, the Hydraulic Riveter Shop c1908, the Blacksmiths Extension 1908, the Air Compressor & Westinghouse Brake Shop pre1910, the Truck Building Yard 1910 and the Machine Shop Extension between 1915 and 1928. 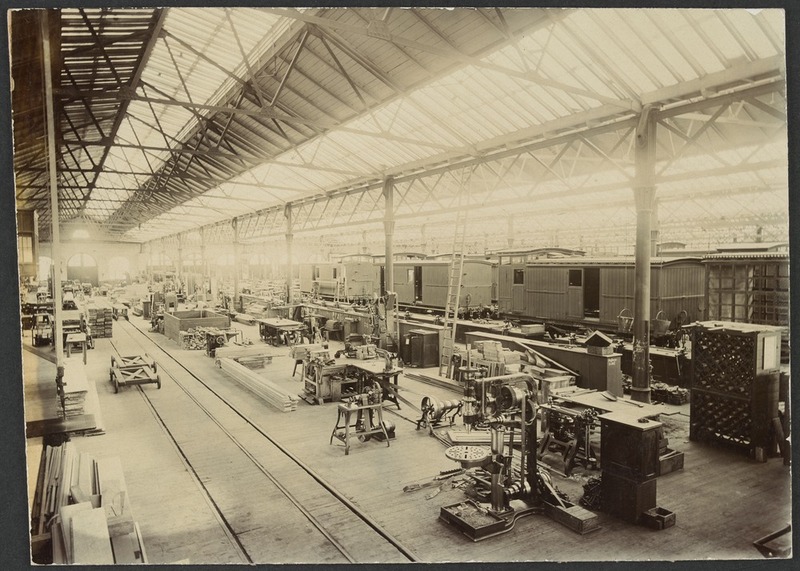 It is likely that the Fitting Shop Extension and South of Fitting Shop Extension were parts of the Williamstown Workshops re-erected at Newport in 1897. They provide an important physical link to the earlier Workshops. The distinctive trusses of these sections and the unusual pole construction of the Boiler Shop Extension are of architectural significance. The West Block Southern Extension is a reasonably early example of sawtooth roof construction. The much taller gable roof sections are evidence of the use of hydraulic equipment, and especially a large gap riveter, in this area c1908. Remnant line shafting, bearings or motor mountings in the timber trusses provide evidence of past machinery layout.